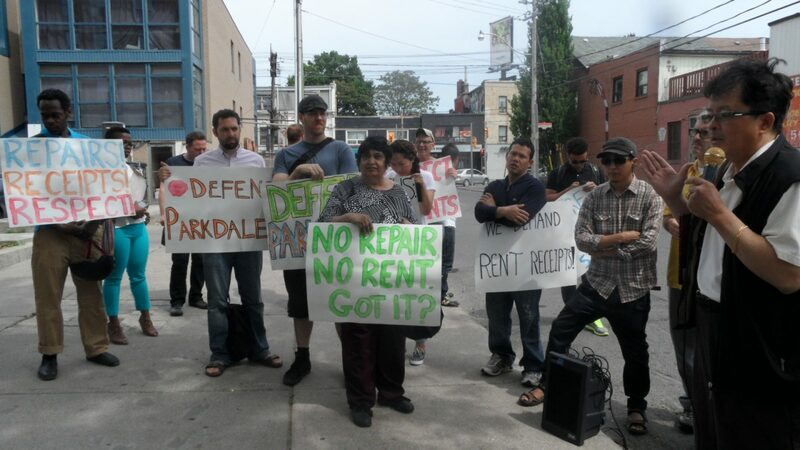 In May, tenants from 99 Tyndall, 77 Spencer, and 188 Jameson faced off with Akelius property managers at their head office in Toronto. We demanded repairs, superintendents, rent receipts on request, and that they drop the 4.1% rent increase at 188 Jameson. Akelius told us they would address our concerns by June 5th. They lied. On June 10th we went back to the Akelius office, now joined by tenants from 95 Jameson. Only this time we were blocked from entering the office by the police and private security guards hired by Akelius. A young man with funny shoes came out from behind the line of cops calling himself the head of Public Relations for Akelius. He told us that Akelius won’t be doing what we asked. They won’t hire supers. The rent increases will not be withdrawn. If we want a rent receipt, we are expected to call their corporate call centre. The repairs? They tell us they will get to them… eventually. 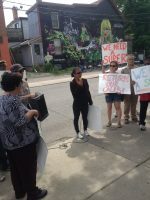 Despite the Landlord’s intimidation tactics and their dismissive talk, we spoke out. Like during our first visit in May, we took turns talking about how Akelius is making our lives miserable. But now, little more than two weeks after that first visit, our voices had become stronger. Participating in collective actions has made us more focussed and determined. Akelius believes they can get away with what they’re doing to us, but we have other plans. We plan to become a force.